The city of Istanbul has become synonymous with the bird migration throughout centuries. Every year during Spring and Fall months, thousands of birds pass through Istanbul’s Bosphorus Strait between Africa and Europe filling Istanbul’s skies, forests and wetlands. Among them are raptors and passerines as well as large winged birds such as pelicans and storks. The number of migrating and existing bird species of Istanbul is around 300, with almost 150 of them breeding in Istanbul. Around 80 species of migrating birds visit Istanbul even in winter months. The migrating birds shuttle back and forth among Bosphorus Strait, Agean Sea, Mediterranean Sea and Black Sea utilizing thermal winds among lands. Some species such as Lesser spotted eagle (Aquila Pomarina) prefer Bophorus Strait as their migration route. Istanbul offers a variety of feeding and nesting areas as forests, lakes, ponds and wetlands for migrating birds of summer and winter as well as native bird species. 6 of these areas are accepted internationally as Important Birding Areas; Terkos Basin, Lake Büyükçekmece, Lake Küçükçekmece, Bopshorus Strait, Princes Islands and shores of Şile & Riva. In Turkey, there are approximately 467 bird species observed. 394 of them are observed regularly, and 300 of them are breeding bird species of Turkey. 77% of the Birds of the Western Palearctic region (Europe, the Middle East, and North Africa), can be observed in Turkey. And 51% of breeding birds are natives of Turkey. Therefore, Istanbul stands for more than half of all breeding bird species in Turkey. In England, there are nearly 552 species of birds are observed, with 272 of them observed regulary. 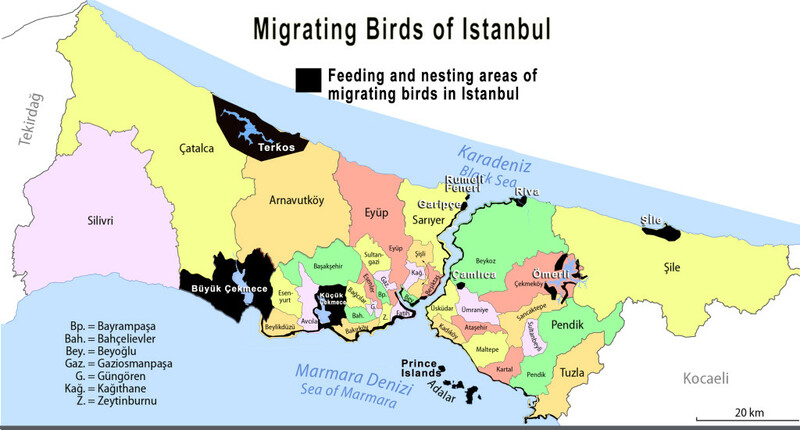 Covering 50 times smaller landsize, Istanbul has 300 migrating birds with 150 of them breeding locally within city limits.